Everyday Australians gave $12.5 billion and 932 million hours to helping others and businesses gave $17.5 billion and more than half managed a workplace volunteering program in 2015-16, according to latest data coming out of Giving Australia 2016. 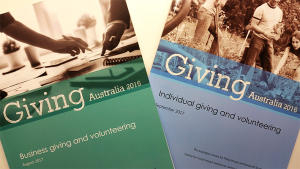 Released this morning in Canberra by the Minister for Social Services, the Business Giving and Volunteering and Individual Giving and Volunteering reports represent the most extensive research undertaken thus far to uncover how, why and how much individuals and businesses give to charity. Giving Australia 2016 lead researcher and Director of QUT’s Australian Centre for Philanthropy and Nonprofit Studies (ACPNS), Associate Professor Wendy Scaife said people who volunteered and donated gave, on average, almost twice as much ($1017.11) as those who donated only money ($536.69). As for Australian businesses, the data is equally optimistic. The business report cites a trend towards businesses of all sizes encouraging giving and volunteering through the workplace. The full reports can be freely downloaded via the Prime Minister’s Community Business Partnership research projects website, along with previous Giving Australia 2016 reports.